Reliable BBC Sport reporter David Ornstein claims Arsenal manager Unai Emery has suggested to Mesut Ozil that he should leave the club. The German playmaker has found himself out of favour at the Emirates Stadium for much of this season, which has led to rumours he could be on his way out of north London. 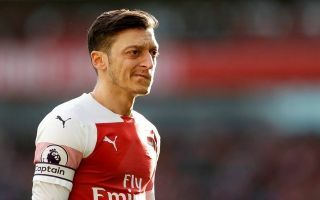 Tuttomercatoweb have claimed Emery has offered Ozil to both Juventus and Inter Milan, though Ornstein’s latest update suggests a January exit is looking unlikely. The BBC Sport man claims Ozil is working hard in the gym with the view of breaking back into the Gunners’ starting XI, though it seems Emery and the club as a whole are united in wanting him gone. “They’re not just rumours. Unai Emery has suggested to Mesut Ozil that it would be best for him to leave the club. And the hierarchy of the club feels that they would like him to move on,” Ornstein told BBC 5 Live, as quoted by Arseblog. This is a surprise development considering the 30-year-old only last year signed a new contract, while he has also generally been a key member of the team for a number of years. While Ozil is far from the best player in the world, he is one of the finest creative players in the Premier League and offers Arsenal the kind of spark and class in the final third that no one else in their squad can. Quite why they’re all so keen to get rid of him is beyond us, but we imagine Ozil would have more than a few suitors if he were made available for any kind of reasonable price.